Entertainment industry satire has been done on TV, and it’s been done often. Just recently, Better Things, BoJack Horseman, Love, Barry, UnREAL, Unbreakable Kimmy Schmidt, Difficult People, and Episodes have smartly skewered the hypocrisy of the entertainment/media business and/or the self-involved trappings of celebrity. It is not a new subject for a television show. 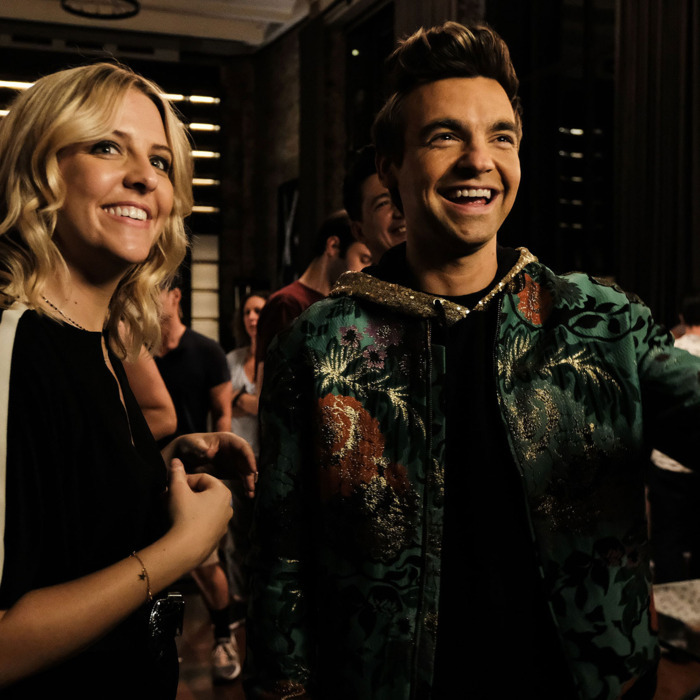 But The Other Two, the ten-episode Comedy Central series that debuts Thursday, is so funny and comes at this territory from such a different side street, that it manages to feel like something entirely fresh. But The Other Two establishes itself immediately as a show that’s warm-hearted, with heavy doses of cringey absurdity. While Chase’s success does make Brooke and Cary feel more than a little inadequate, they respond with befuddlement to what’s happening to their baby brother, and then with a desire to shield him from the vultures. Not surprisingly, that humane humor matches the sensibility that Kelly brought to his first feature film, Other People, which, like his new series, starred Molly Shannon as the mother. In The Other Two, Shannon plays Pat, a widow who is super-supportive — with an exclamation point! — of all her kids, including her Chasey. After that breakout music video, she swiftly sets him up with Streeter (Ken Marino), an overeager dumbbell of a manager whose name sounds an awful lot like Scooter, as in Braun; a no-nonsense publicist played by Wanda Sykes; and a team of other hangers-on devoted to turning ChaseDreams into a brand, no matter how it affects him as a person. Pat is so swept up in all the excitement that she never pauses to question whether her younger boy is being exploited by the music industry and MTV/VMA machine. That job falls, increasingly, to Brooke and Cary, who are forced by circumstance to become something they’re not used to: the grown-ups in this situation. In the Kelly–Schneider version of reality, everyone who works in show business isn’t a truly awful person, but most of them are definitely idiots. Which, given how dark things get in other entertainment and media satires, not to mention real life, may be a slight fantasy. But it’s also refreshing. That’s not to say that The Other Two avoids addressing substantive trends: the gross fixation on social media, the sexualization of young celebs, and the way that Hollywood treats gay men — Cary, who is gay, is asked to downplay his orientation for the sake of that aforementioned fart-smelling commercial — are all touched upon, usually in a wry vein. “Your teens are for working and your 20s are for resting,” says one young influencer at a movie premiere after-party. “What are your 30s for?” Brooke asks. As Brooke and Cary, Yorke and Tarver have a lived-in rapport that makes it easy to believe they are siblings who serve as each other’s sturdiest sounding boards. The lives Brooke and Cary lead are so in sync that they often have parallel experiences without even realizing it, a phenomenon the series evokes through the amusing, recurring use of split screen. Chase’s fame slowly transforms them both, and Yorke and Tarver register those changes with appropriate subtlety, allowing us to see a connection between Brooke’s stubbornness and her ability to strongly advocate for Chase, as well as Cary’s acting ambition and the way Chase’s success unleashes his thirst for attention. Yorke and Tarver are also surrounded by a fantastic cast of regular and recurring players, not to mention tons of familiar faces making cameo appearances, including Patrick Wilson, Beck Bennett, Andy Cohen, Heidi Gardner, and Richard Kind as Cary’s constantly side-hustling agent. In every phone call with Cary, the camera pulls back to reveal some other random gig-economy job Kind’s character is simultaneously working. Like that agent, The Other Two is a multitasker, a show that deconstructs fame, explores the dynamics in a family still grieving a loss, and casually peppers conversations with deliberately ridiculous pop-culture references. It’s charming and rude, a combination not a lot of shows can pull off, and unlike its sibling protagonists, it knows exactly who and what it is right from the beginning. It’s a great show, no PR spin necessary.